APCOA drives business partnerships with major car park improvements. Pic shows Kathryn Shillito, HullBID Executive Director, with Jethro Shearing (left) of Dove House Hospice and Clinton Cooper of APCOA. The operator of one of Hull’s biggest car parks has embarked on a significant improvement programme which will make the site safer and cleaner and generate thousands of pounds for a major charity in the region. APCOA is already receiving positive feedback from business clients who use the King William House car park in Market Place, Hull. They hope to attract more users as the refurbishment continues, and as new neighbours arrive in an adjacent residential and commercial development. 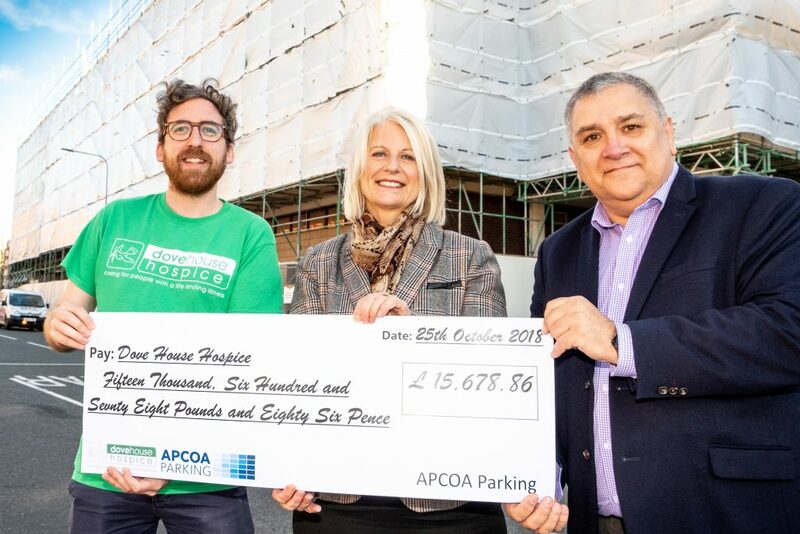 Increased visitor numbers at the car park will also mean more money for Dove House Hospice from an innovative, ongoing fund-raising partnership which sees APCOA donate £5 of every £35 monthly season ticket. In addition, Dove House Hospice receive 5 per cent of weekend revenue. The renovation works follow the decision by APCOA earlier this year to commit to a new long-term lease on the multi storey car park which has 630 spaces. The work, which will be completed during 2019, includes resurfacing, repainting and installation of energy-efficient LED lighting. The company are also investing in new parking equipment, including the introduction of online payments, which will enable their customers to arrive and leave the car park more quickly. Along with improvements to security, the changes have enabled APCOA to open the car park 24 hours a day, 365 days a year. As part of its efforts to strengthen its links with Hull’s business community the company is supporting the Hull Business Improvement District (HullBID) Annual Awards by sponsoring a category and providing free parking for people attending the ceremony at nearby Hull Minster on Friday 22 February 2019. Jethro Shearring, Fundraising Coordinator at Dove House Hospice, said: “This makes a massive difference for us. There was a week in 2017 when APCOA shut off all the pay stations and did bucket collections instead and we raised £2,500. “Now we have a percentage of ticket sales going to the hospice and it works really well. The customers appreciate the fact that money is coming back to the local community. “Schemes like this and the other support we get from businesses are massively important. They enable us to do more and to remain at the forefront of palliative care. Kathryn Shillito, HullBID Executive Director, said: “The investment by APCOA is really important to our business members in the city centre, and to their staff and customers. It adds to the appeal of the Old Town, where a number of other improvement programmes are under way – not least in King William House, which adjoins the car park. Be the first to comment on "APCOA drives business partnerships with major car park improvements."